This entry was posted on May 15, 2014 at 4:50 pm and is filed under 1980s, Music, Rock, Uncategorized with tags British, Classic Rock, George Harrison, John Lennon, Mellow out rock, melodic rock, Paul McCartney, progressive rock, Somewhere in England, The Beatles. You can follow any responses to this entry through the RSS 2.0 feed. You can leave a response, or trackback from your own site. Well said, he always seemed a gentle man to me. Thanks, I always thought so. He did do a lot of charity work as well. 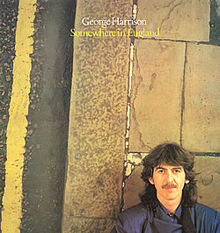 I always thought George’s catalog was underrated. It’s like All Things Must Pass & Cloud Nine were all you ever heard about until they started to get reissued. Every time I listen to one of his other albums I’m never disappointed, he always had good tunes. He was definitely underrated and you are absolutely right about him having good tunes. Crackerbox Palace off 33 1/3 is definitely my favourite. Harrison was the best, no doubt about it. When he played the rest listened. Definitely agree with you there.